One of my students approached me earlier in the day and informed me that today is the 68th anniversary of D-Day. So today, I figured I'd share a few cards from the 2009 Topps American Heritage Heroes set. If you're not familiar with this set, it is made up of 125 regular issue cards broken down into 11 subsets ranging from military heroes to humanitarian heroes. There are also an additional 25 short printed cards that focus on President Abraham Lincoln and President Barrack Obama. I picked up a few of these sets to give away to students who were interested in U.S. History. If this topic interests you, I encourage you to go out and grab a set, because you can learn a lot from the information written on these pieces of cardboard. 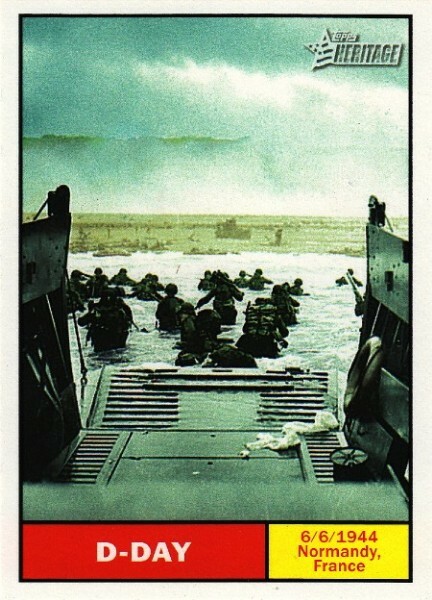 Two of the cards in the set relate to the 68th anniversary of D-Day. From 1940 to 1944, France was occupied by Germany. The Allied forces decided to invade Normandy in an effort to free France. They used a two phased attack: airborne & amphibious. Approximately 24,000 Allied soldiers were involved in the airborne attack that took place hours before the beach landings. Their jobs were to seize key objectives and to keep the Germans occupied and confused. At around 6:30am, the amphibious phase took place. It is the largest amphibious attack in recorded history. The attack covered 50 miles of beaches and used approximately 160,000 troops and 5,000 ships. Many people consider D-Day the turning point of the war in Europe. The Invasion of Normandy (code name: Operation Overlord) was the beginning of the end of World War II. Over 9,000 Allied soldiers were killed or wounded, but it enabled over 100,000 soldiers to begin their march across Europe and eventually defeat the Axis powers. 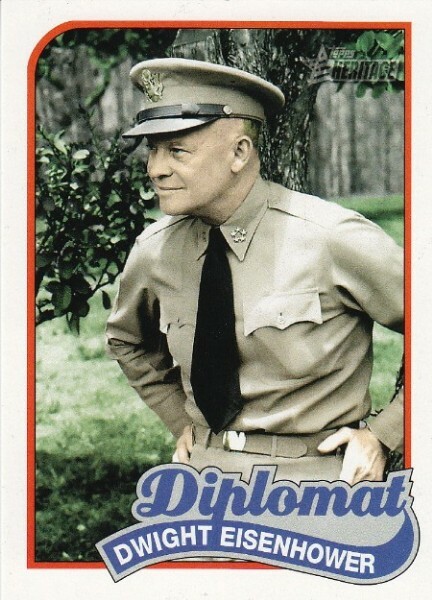 Eisenhower, a five-star general of the United States Army, served as Supreme Commander of the Allied Expeditionary Force for the Battle of Normandy. He was in charge of planning and carrying out the plans of Operation Overlord. It's moments like this in U.S. history that truly fascinates me. I can't imagine what the world would be like today had the Allied invasion failed. But thankfully they didn't. Which is why, it's important to honor those who have fought for our country and our freedom. 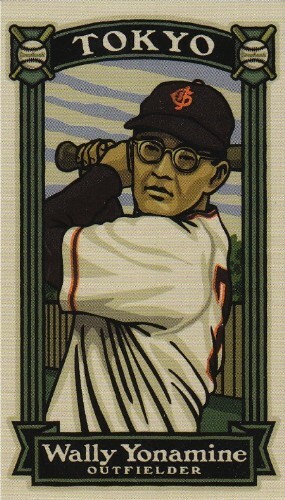 And it's cards like these that remind us that we can still learn a thing or two from our cardboard collectibles. Robert Fitts, the author of Banzai Babe Ruth, sent me a few of these promo cards to give away to my readers when I purchased an autographed copy of his book. If you'd like a chance to win a pair click here. Thanks for taking the time to read my blog posts! Thanks guys... appreciate you two taking the time to read my writing. Thanks... appreciate you taking the time to read my posts. By the way... Love your blog too!